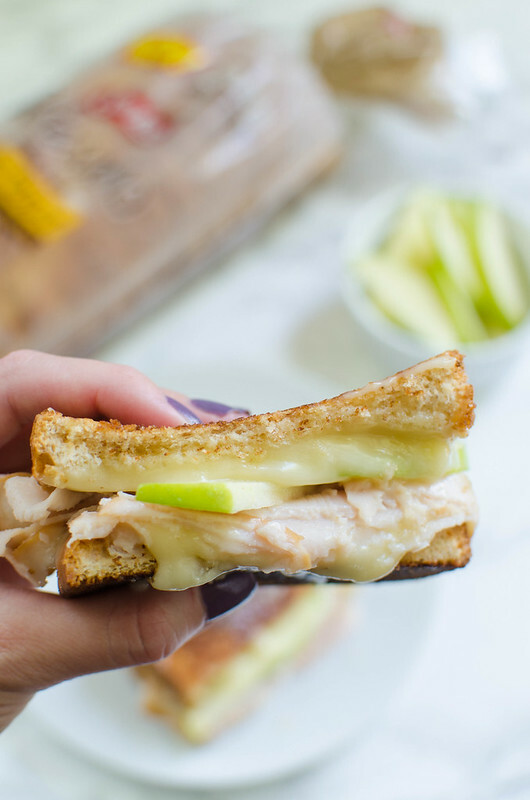 Apple and Brie Grilled Cheese – the perfect fall sandwich recipe! 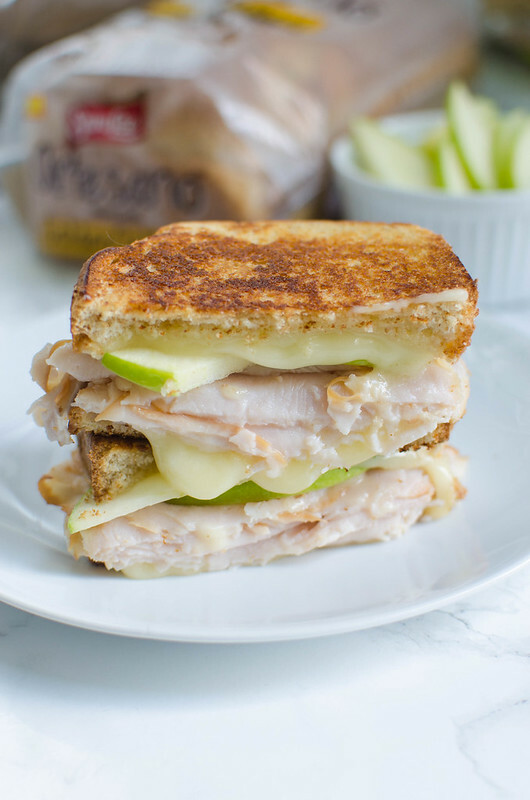 Turkey, brie, and fresh apple slices. Plus, a honey drizzle! Have I told you guys that I’m obsessed with sandwiches lately? I’ve never in my life been a sandwich person. I don’t ever just make a sandwich for lunch or go to a sandwich shop. 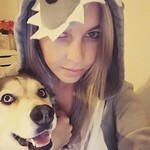 But one day a few weeks ago, I was in a mood so I took the husky for a hike and spent the entire hike thinking about sandwiches. Like, 3 hours of thinking about sandwiches. When my phone had service, I was on Yelp looking up sandwich places in the area. I got a sandwich on the way home and haven’t stopped ever since. So to say that this Apple and Brie Grilled Cheese is my favorite thing I’ve made in a while is the understatement of the year. 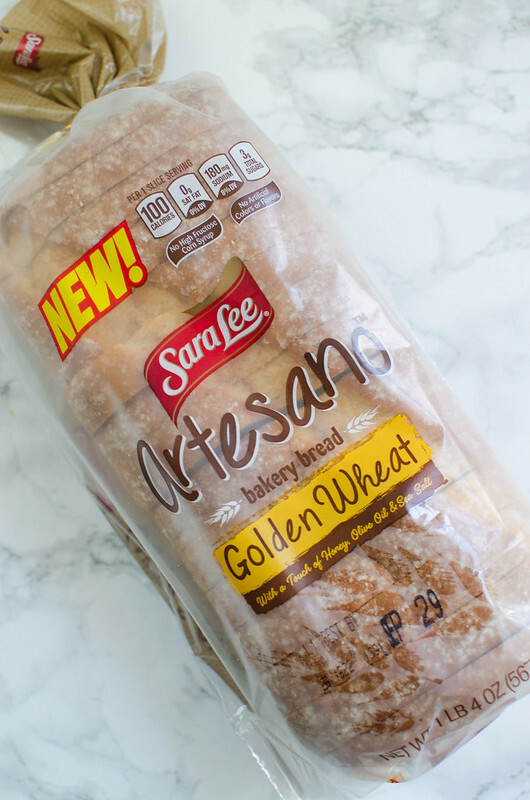 It doesn’t hurt that it’s on this fabulous Sara Lee® Artesano™ Golden Wheat Bread. It’s like the thickest, fluffiest sliced bread you can imagine. It gets perfectly crispy on the outside and stays soft on the inside and, you guys, I don’t think I’m getting over my sandwich thing any time soon. It has no high-fructose corn syrup and no added colors or flavors. It’s made with olive oil, salt, and just a touch of honey. 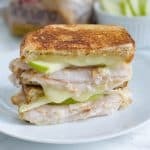 Apple and Brie Grilled Cheese! The thing about this bread is that because it’s so thick, it really holds up to whatever fillings you want. And y’all know I’m not just making a turkey and sliced cheddar sandwich and calling it done. 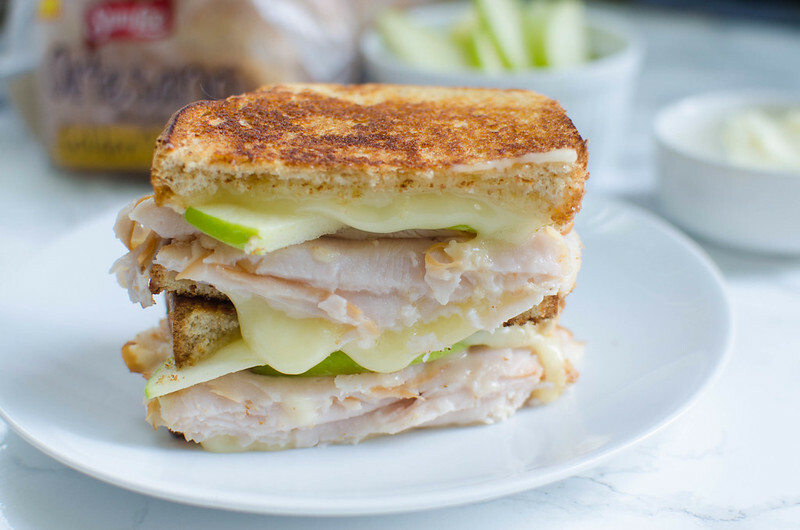 I want to drizzle the bread with honey and then layer turkey, brie, and fresh apple slices inside. And then spread some fresh thyme butter on the outside before frying it. Is this not the most perfect fall sandwich you’ve ever seen? I’m doing grilled cheese for everyone next time I have a football party. Begin by mixing the fresh thyme with the room temperature butter and set aside. Place two slices of bread on a cutting board and drizzle each slice with honey. Add half of the Brie to one slice followed by the sliced apples and the smoked ham. Add the remaining Brie on top and cover with the remaining slice of bread, honey side down. Evenly smear the thyme butter onto both exteriors of the sandwich and set aside. Grill the sandwich in a cast iron skillet until the bread is golden brown and the Brie has melted (approximately 5-10 minutes). Remove from heat and let sit for 1 minute before slicing in half.